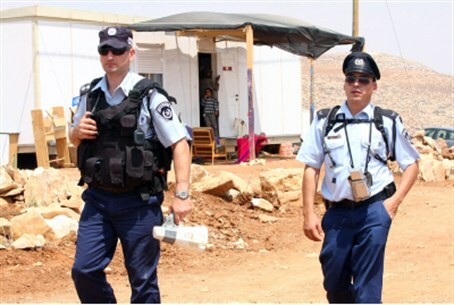 Government security forces arrived Wednesday morning in Gush Etzion to tear down caravan homes at Ma’ale Rehavam. Government security personnel arrived Wednesday morning in Gush Etzion to tear down caravan homes at Ma’ale Rehavam, a small town located off Route 3698 near Highway 60. Ma'ale Rehavam was founded in 2001 in reaction to the assassination of former Tourism Minister Rehavam "Gandhi" Ze'evi, an ardent supporter of Jewish settlement in Judea and Samaria. The residents pride themselves maintaining the community on the ecovillage model, focusing their efforts on cultivating olive and almond groves, a muscat grape vineyard, and an orchard growing thirty-five different fruit varieties. Roads leading to the area, near Kfar Eldad, were sealed off to prevent anyone from reaching the site and interfering with the demolitions, including neighboring residents. Forces included hundreds of security personnel, five bulldozers and fifty porters, according to a local source at the scene who spoke with Arutz Sheva on condition of anonymity. The alleged targets of the police and IDF soldiers who were at the scene are apparently six caravan homes that allegedly were built outside the official community boundaries, the source said. Gush Etzion Regional Council head David Perl appealed to Prime Minister Binyamin Netanyahu to stop the destruction of the homes, saying in a statement the decision was made “for no reason or benefit." “The Levy report, which the government of Israel commissioned, determined that there is no place for the demolition of unorganized communities and that other solutions within the rules of law and justice can be found,” Perl pointed out. “The government must immediately confirm the report so that we can stop watching the injustice and harm carried out towards the settlers and pioneers, as is occurring this morning in Ma’ale Rehavam,” he said. “The Gush Etzion Council will provide all the necessary assistance to help affected residents deal with the unnecessary and harsh destruction,” Perl vowed.